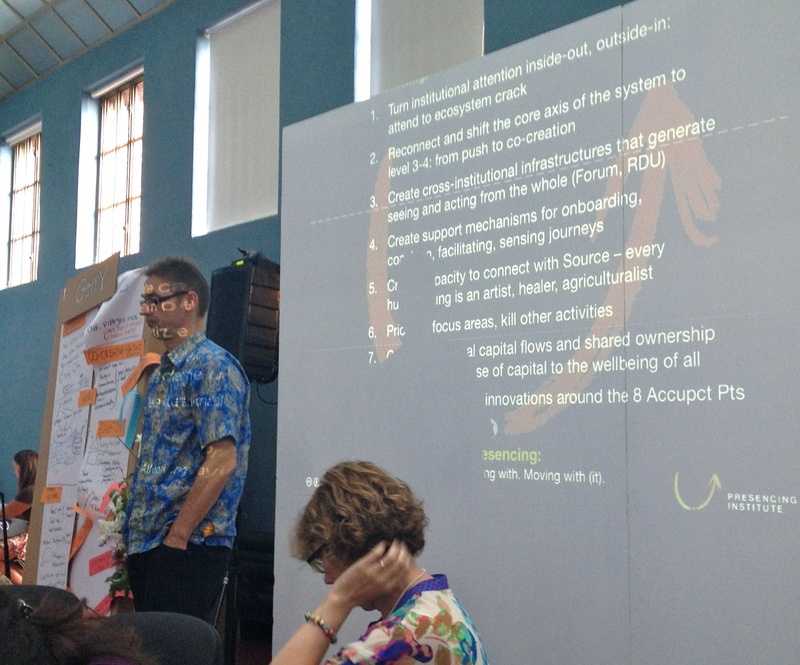 From Saturday to Friday I facilitated at the ALIA Conference Europe 2013 with Arawana Hayashi the ‘Presencing: Leading for Profound Innovation and Change’ Track. It turned out to be a wonderful experience. The flow of the whole conference was beautiful with a lot of art and awareness practices. We had in our track (there are 6 parallel tracks that come together everyday) 27 participants from Bermuda, Colombia, Canada, Zambia and most European countries. We were keen to make it a special experience for everybody and that happened in a profound way. More to be shared later. Thank you for the wonderful work we allowed ourselves to do on those powerful intensive days. Here I am in Angola full energized by your sharings, insights and confidence on an inspired vision of a better world. Yes! This is a very happy bunch of people! And we had an inspiring and mindful journey together. Thank you to all co-travellers and our two wonderful guides, Arawana and Hein, for hearings being and listening. And many thanks for all the photos and impressions, the most beautiful workshop summary I ever received. Thank you Hein and Arawana for the generosity of your teaching and sharing. Thank you all for the beautiful field of exploration and learning that we co-created. Thank you Sylvie for the beautiful photos featuring our hearts singing. I am grateful to have met you and wish you all a fulfilling journey ahead. With love from your birthday girl. Thanx for the sharing of the pictures, stories and good wishes in the emails. And also from me big thank you for all the excitement, joy, sharing, slowing down, and storytelling of the past week. It was incredible. Lots of love to all of you! Let’s keep the beauty of it alive! So thanks so much for sharing your impressions – it keeps last week closer! I thank you so much for the wonderfull work we did together, and thank you so much for the presentation you sent us and the link. And thank you Silvie for the two pictures of our group. Many thanks for this wonderful week. These 5 days with you and all the ALIA travelers were for me an inspiring journey of deep discovery. I am happy I joined you all in Driebergen. And many thanks for the impressions, the most beautiful workshop summary I ever received. Hein, thank you for your generosity and the beautiful story constructed here. It will all live with me for a long time. With love to you all. Arawana, you are a goddess! A naughty playful child, inside a sage elder! You can cut heads with grace. Hein, you are an eternal teenager in a Dutch grown-up body. Never doubt the power of presencing to us disciples.